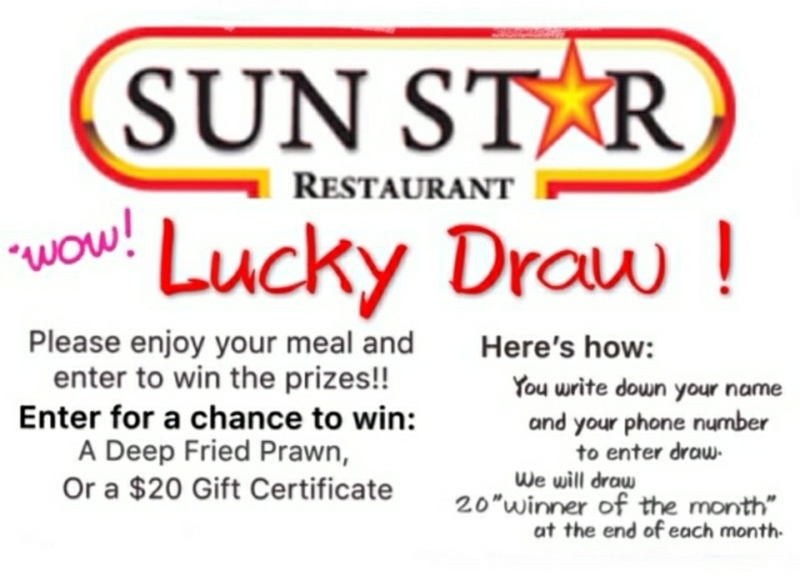 Canadian and Chinese cuisines prosper in harmony at Sun Star Restaurant. We are a family restaurant dedicated to serving delicious Western and Chinese cuisine to the communities of Coquitlam, Port Coquitlam and Port Moody. Our restaurant has a wide variety of options for diners. We offer specials for breakfast, lunch and dinner, and our menu is very versatile. In particular, our Chow Mein menu offers a variety of great options, ranging from Sun Star House Special Chow Mein to Beef & Broccoli Chow Mein. Our Mandarin Sweet & Sour Pork is well known among the locals while Dry Garlic Boneless Pork is one chef's best creations. The Tender Beef with Black Pepper is a great illustration of our diversity, and our family special combos make your money even more valuable. Whether you are in the mood for Seafood or just tasty Honey Garlic Chicken, we have something great to offer. 2 eggs with choice of sauage, ham or bacon with hash browns toast.